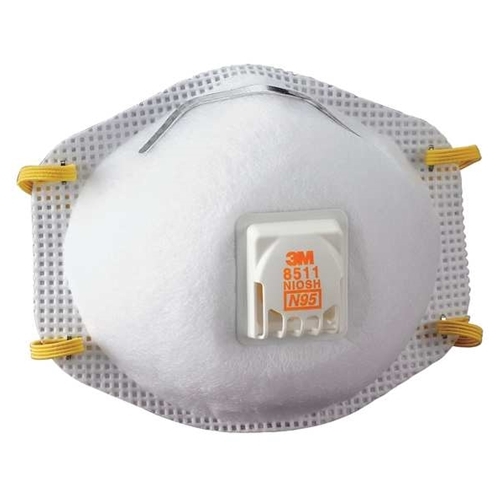 3M 8511 N95 Particulate Respirator w/Cool Flow. Uniquely designed to help provide protection, the 3M 8511 Respirator is ideally suited for work settings that involve heat, humidity, or long periods of wear. Workplace applications include grinding, sanding, sweeping, bagging and other dusty/hot operations. It features the 3M Cool Flow Exhalation Valve and adjustable M-noseclip to help provide a custom fit and secure seal. The 3M 8511 N95 is one of the most popular N95 respirators we offer. The "Cool Flow" makes it a very comfortable respirator that you can wear for a long period of time. Compared to the other respirators the 3M 8511 Respirator is one of the more versatile N95 respirators. Fitted with a 3M Cool Flow™ Exhalation Valve, this respirator is ideally suited for work situations involving heat, humidity, or long periods of wear. The proprietary 3M Cool Flow valve is designed to release hot, humid exhaled breath quickly, helping to prevent an unpleasant build up of heat inside the facepiece - a significant cause of discomfort to respirator wearers. The Cool Flow valve’s efficiency in keeping breathing cool and comfortable has been demonstrated through testing*: the atmosphere inside a respirator with a Cool Flow valve is on average 7.5°F cooler than the similar product without the valve. This makes Cool Flow valve respirators ideal for long periods of wear, especially where conditions are hot, humid or physically demanding. *Testing conducted in a 3M laboratory. Testing protocol, data generation and conclusions were reviewed and approved by an expert from The University of Minnesota. The testing performed by 3M is not a part of the testing and certification conducted by NIOSH. Breathing hazardous particles can pose a risk to your health. NIOSH, a Federal government regulatory agency, has tested and approved the 3M Particulate Respirator 8511, which is designed to help reduce exposure to certain airborne particles. WARNING: These respirators help reduce exposures to certain airborne contaminants. Before use, the wearer must read and understand the User Instructions provided as a part of the product packaging. In the U.S., a written respiratory protection program must be implemented meeting all the requirements of OSHA 1910.134 including training, fit testing and medical evaluation. In Canada, CSA standards Z94.4 requirements must be met and/or requirements of the applicable jurisdiction, as appropriate. Misuse may result in sickness or death. For proper use, see package instructions, supervisor, or call 3M OH&ESD Technical Service in USA at 1-800-243-4630 and in Canada at 1-800-267-4414.